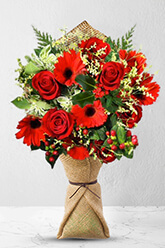 This stunning assortment of seductive red roses and Gerberas is sure to turn heads. Send this when you want to send a gift that will not fail to impress! 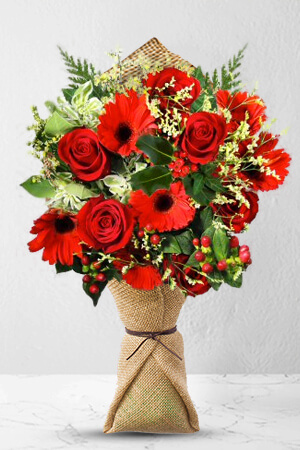 With its rich seasonal greens this is a perfect arrangement for the holidays or Mother's day.Vase not included however; we suggest including a Superior Vase with your gift to dazzle the recipient even more. Great price...Super fast delivery...Fiancée was overjoyed...Thank you! My cousin thought the flowers lovely & delivery great but not up to your usual standard in the way water was put around the flowers. Just a thin plastic bag. Fantastic service very easy to follow on line and delivered to the door as expected on time as requested. Timely delivery. Quality of flower bouquet could improve. My cousin told me that the flowers are beautiful &excellent quality.